Cheese, loved by so many, is also such a versatile ingredient. Something magical happens to the flavour when it is heated. Becoming more savoury, salty and intense on the palette. Even when eaten with crackers it benefits vastly when left out of the fridge to come up to room temperature. 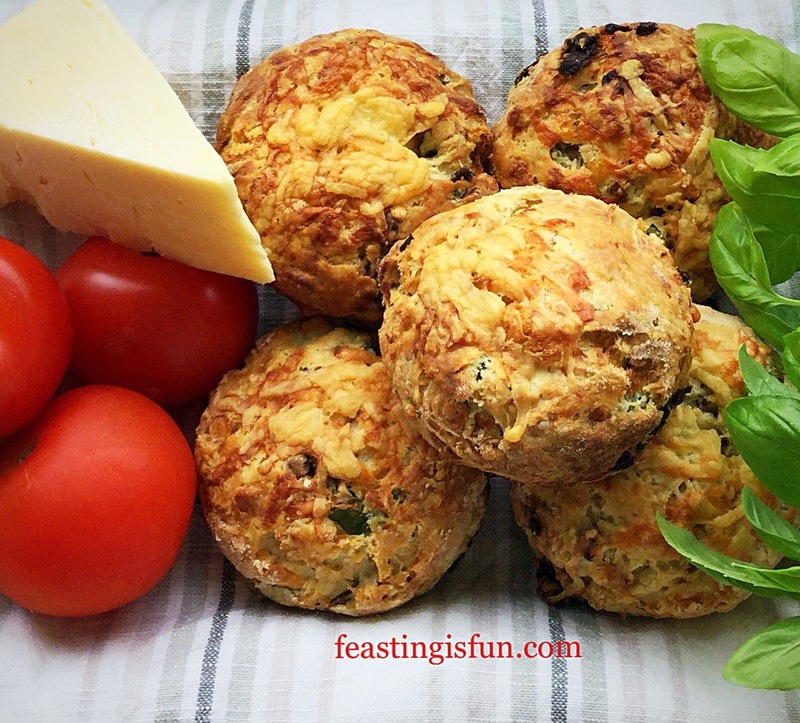 Since winning some Vintage Cheddar in a Twitter competition I wanted to create a new, delicious snack recipe. 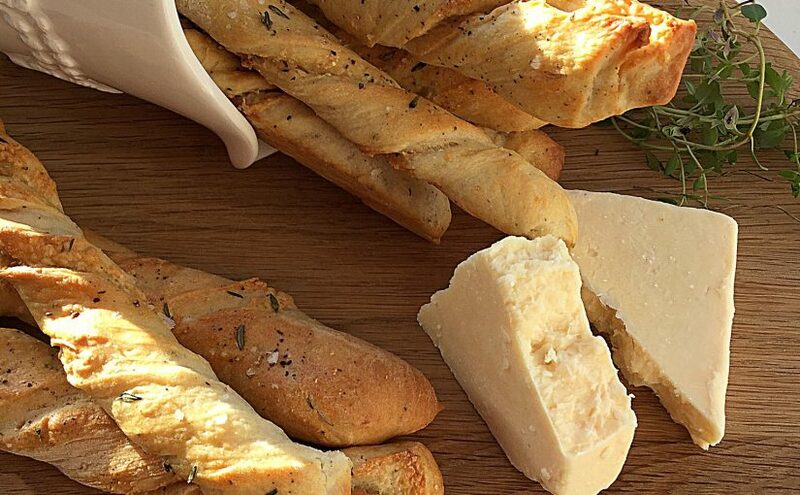 These Cheddar Cheese Thyme Soft Breadsticks tick every, single, box. 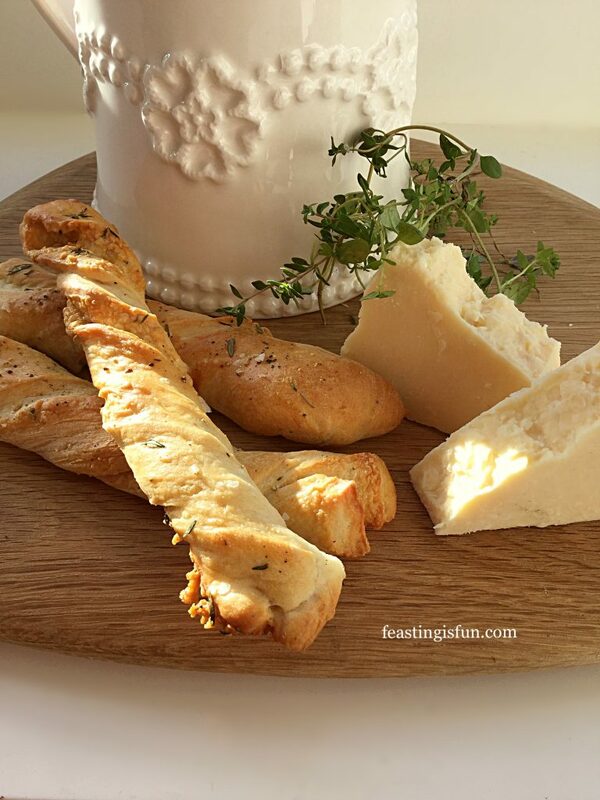 The combination of good quality mature, or vintage cheddar with fresh thyme gives a distinctly savoury flavour to these breadsticks. 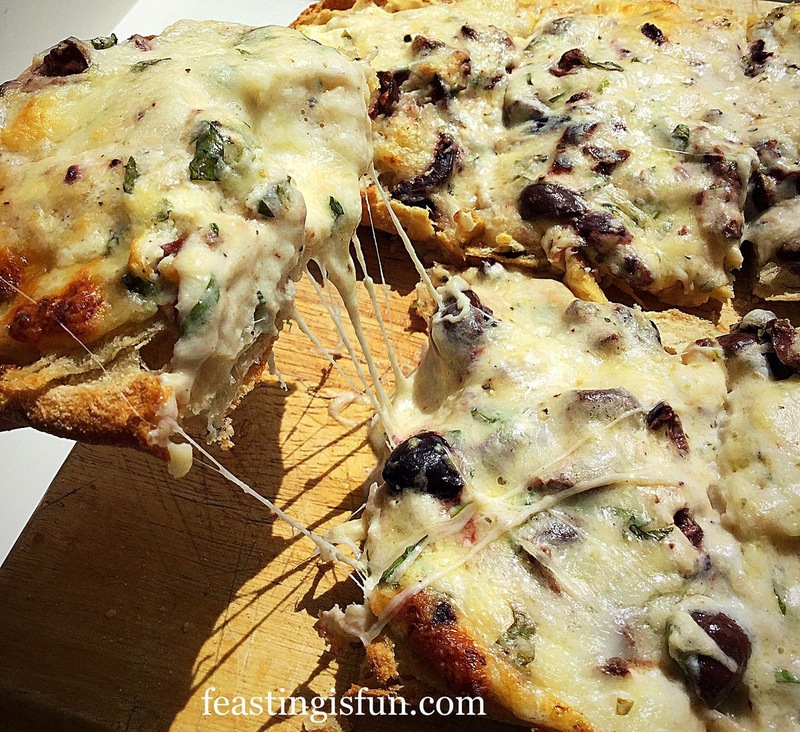 Also, the addition of Parmesan cheese to the bread dough enhances and reaffirms their cheesy flavour. While pastry cheese straws can be oily at times, that is not the case here. No greasy fingers whilst munching on these! As well as tasting delicious on their own, these cheesy breadsticks also make a perfect accompaniment to soup, such as Hearty Minestrone Soup. While sounding an unlikely combination, we ate these with a simple beef casserole that had been bubbling away on the hob all day. Not so surprising when Cheddar is often used in the pastry of well made beef pies. The method given uses a stand mixer with dough hook attachment to make the dough. Of course this may be made by hand. Weigh the water into the bowl of the stand mixer. Add the dried yeast and flour. Next add the olive oil and salt. Lower the dough hook and mix on low speed for 10 minutes, increasing to medium speed for a further 3 minutes. While the dough is mixing lightly oil 4 large baking trays. Also preheat the oven to 200C/180C fan, 400F, gas mark 6. Stop mixing and check the dough. It should be able to stretch so that light can be seen through it. This is called the windowpane test. If the dough does not pass this test lower the dough hook and continue to mix on medium, stopping and checking every two minutes until it finally passes the test. As soon as the dough is ready stop mixing. Add both the finely grated Parmesan cheese and 50g of the cheddar. Also add 2 teaspoons of fresh Thyme leaves and half a teaspoon of freshly ground black pepper. Lower the dough hook and mix on a low speed for two minutes. Stop the mixer, scrape any dough from the dough hook into the bowl, cover with a cloth and leave in a draft free place until doubled in size. Lightly flour the worktop and tip out the dough, so that the top of the risen dough is on contact with the worktop. Dust the dough with flour and roll out to 50cm x 30cm (20in x 12in). Preparing the dough to become breadsticks. Sprinkle over the rolled out dough, 75g finely grated cheddar and 1 teaspoon of fresh thyme leaves. 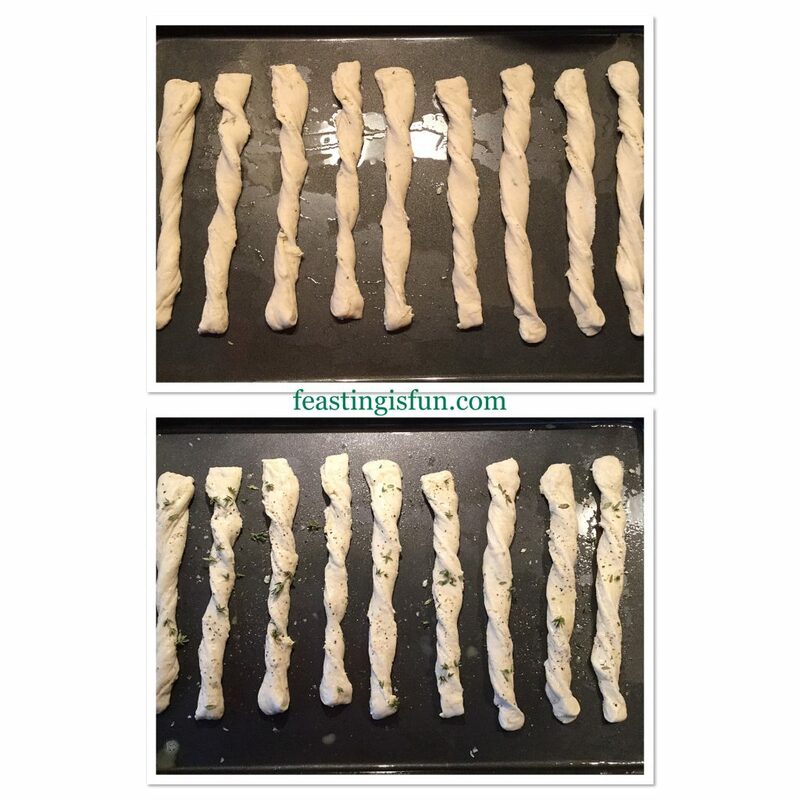 Folding and cutting the dough into breadsticks. 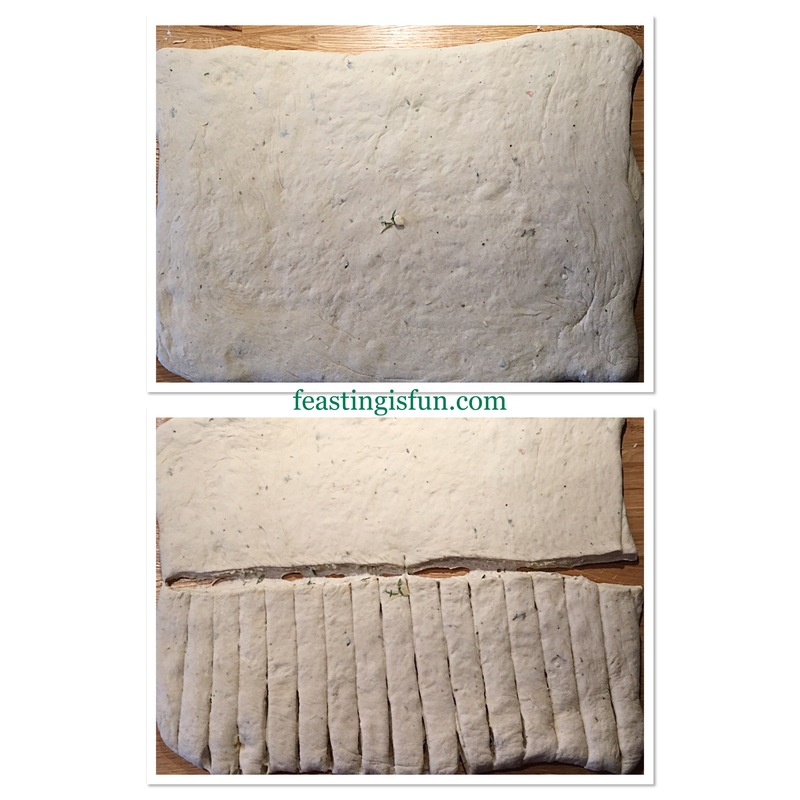 Gently roll over the folded dough with a rolling pin, sealing the cheese inside. Cut the dough in half across the middle. Next cut 1cm (1/2in) strips in the dough. Preparing the breadsticks for baking. 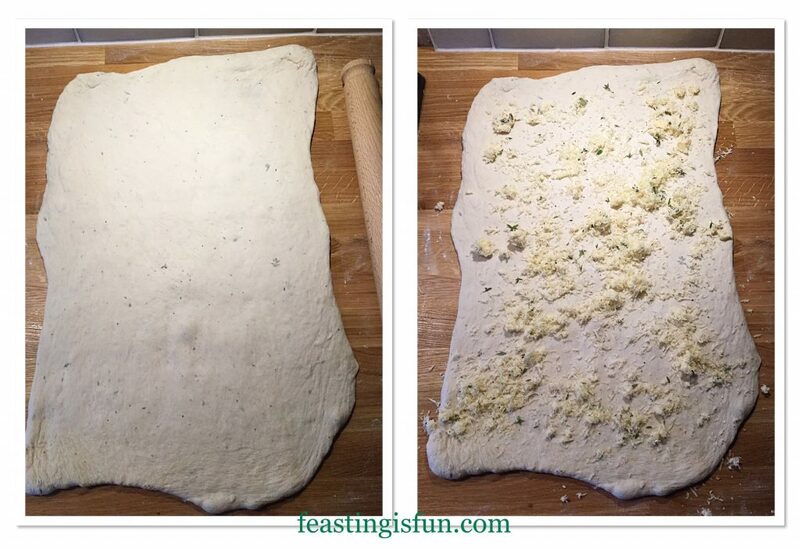 Removing one dough strip at a time, stretch and twist it before placing on a prepared baking tray. 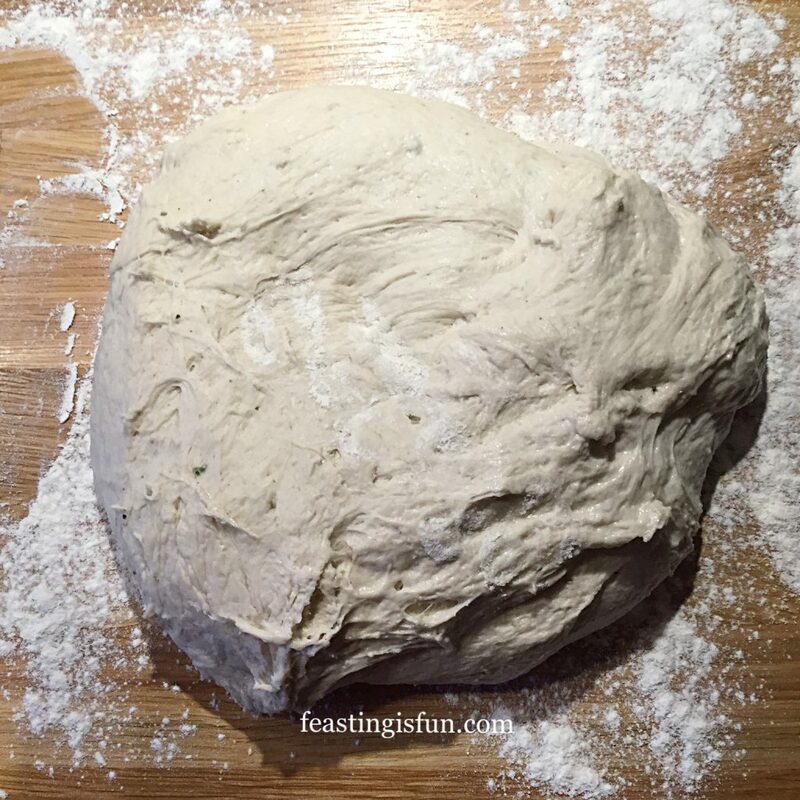 The dough can be pressed on to the tray and will stick, holding the twist in place. Place eight breadsticks on each tray. 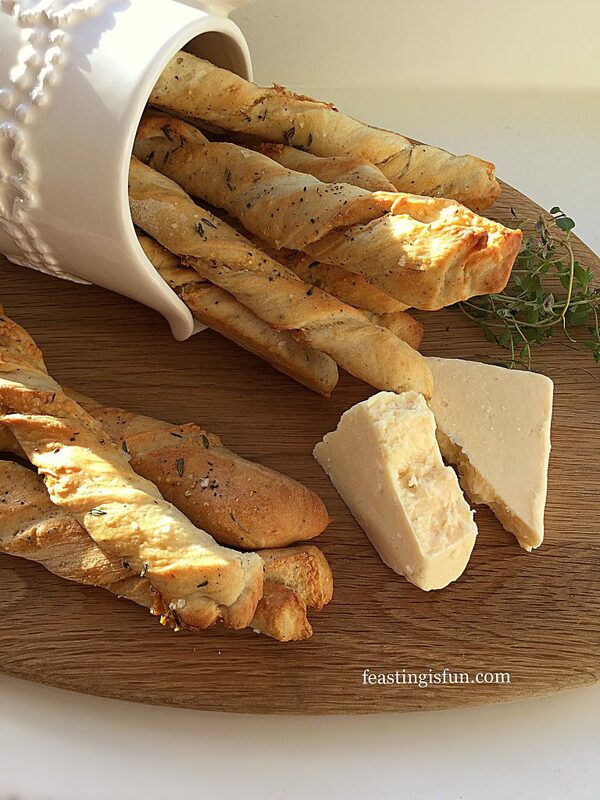 Brush each breadstick lightly with egg wash and sprinkle over 1/2 teaspoon of thyme (for each eight breadsticks). Also grind black pepper and sprinkle a pinch of sea salt over the tray. Place two baking sheets in the preheated oven on separate shelves and bake for 15-20 minutes. 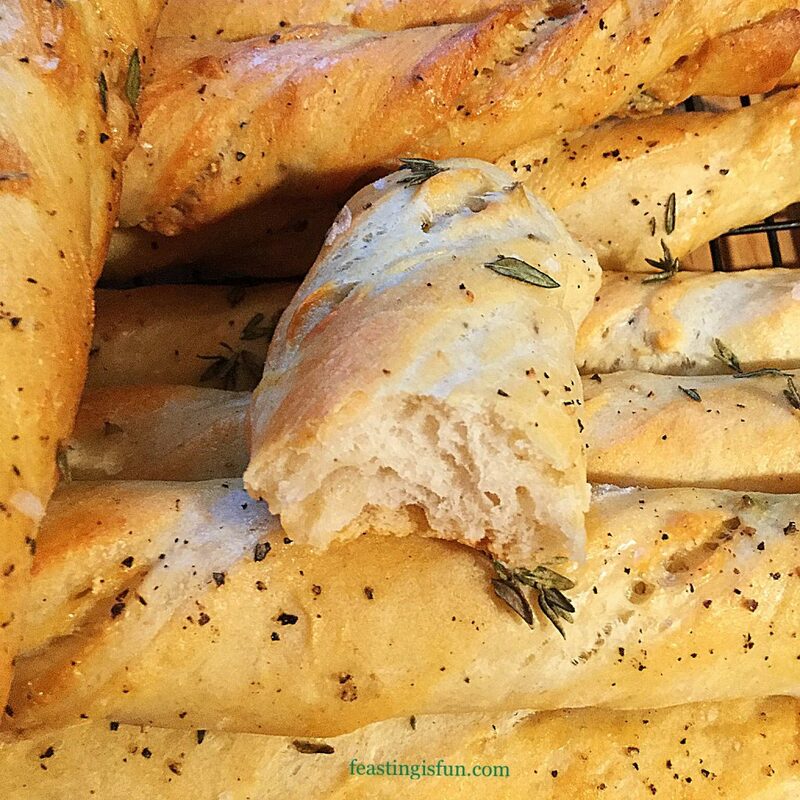 The breadsticks are baked when they are a light golden brown. 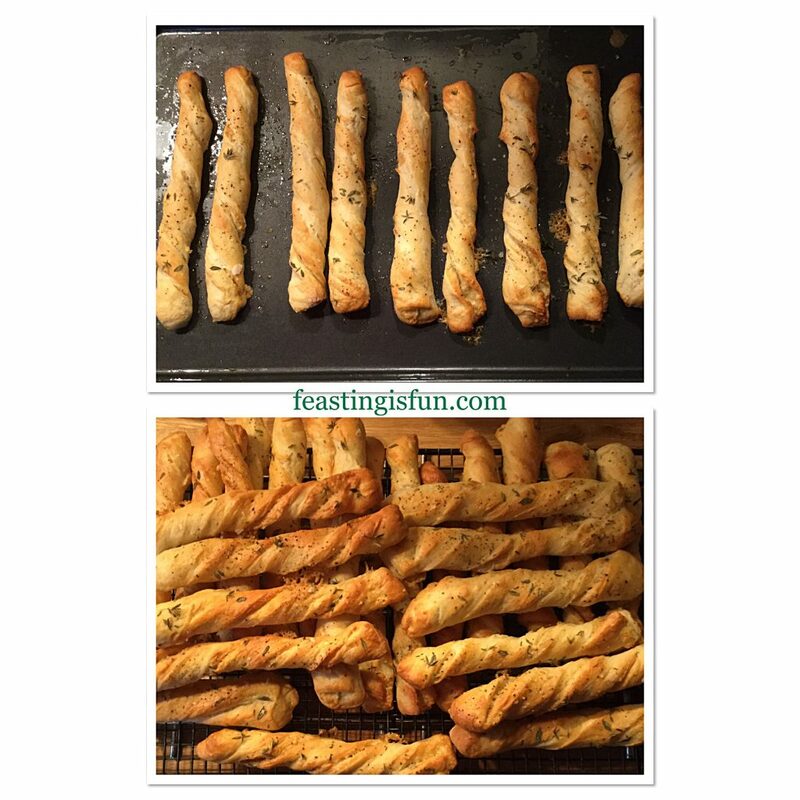 As soon as the breadsticks are baked remove from the oven and place on a cooling rack. Continue with the other half of the dough, cutting, twisting, egg washing and sprinkling and finally baking as before. 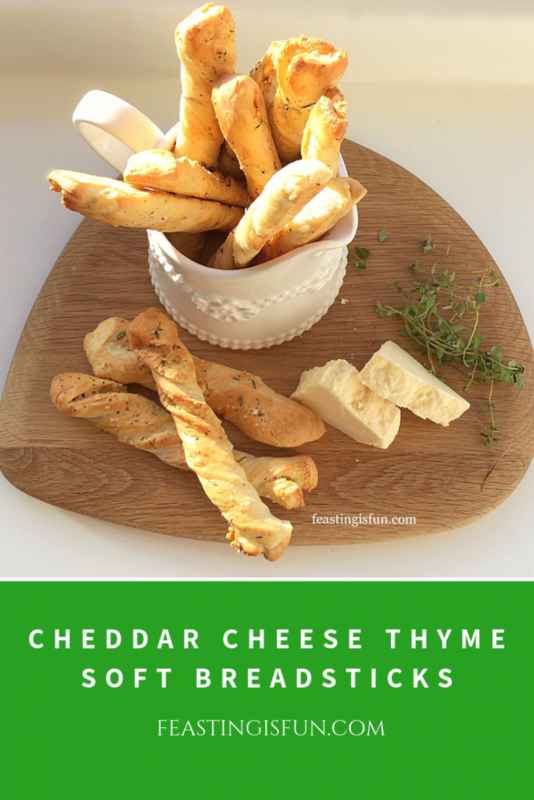 The soft inner crumb of these Cheddar Cheese Thyme Soft Breadsticks. Wait until slightly cooled before biting into one of these deliciously cheesy breadsticks, with its soft, fluffy inner. Serve slightly warm to allow for the best possible taste experience. At there best enjoyed on the day these are made. 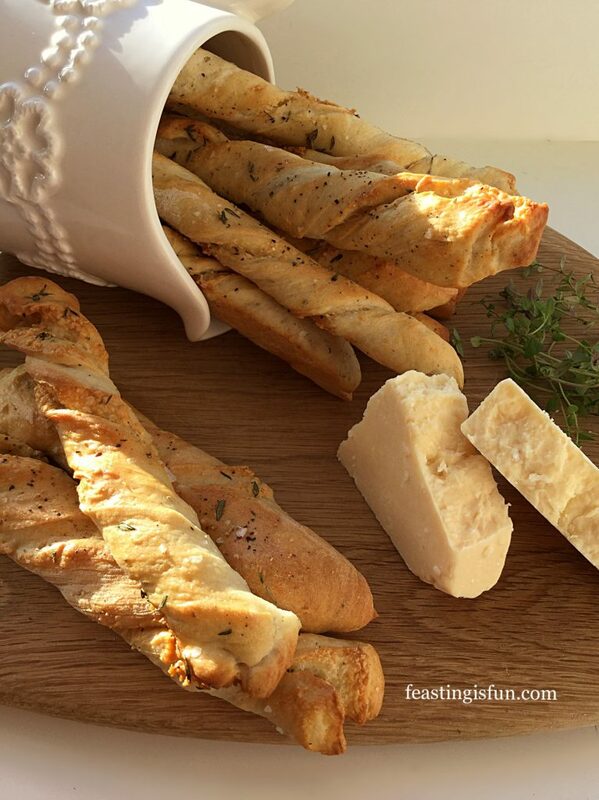 Since this recipe makes a big batch of Cheddar Cheese Thyme Soft Breadsticks, they can be enjoyed at larger gatherings and are ideal for adding to a buffet table. To make ahead, bake as usual, cool and freeze for up to two weeks. Remove from the freezer when needed, place on a baking tray in a warm oven for 10 minutes to defrost and warm through. Creating recipes using ingredients that compliment and enhance each other is at the heart of Feasting is Fun. Likewise, encouraging people to share. 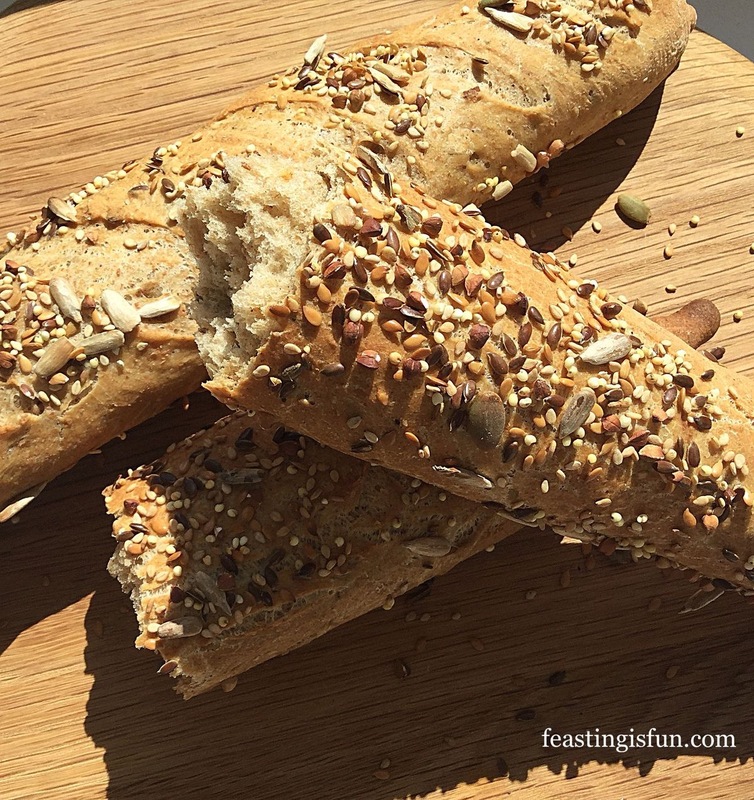 Baking extra to give away, to an elderly neighbour or new family, is easy. Especially when you are in the kitchen already, whipping up a batch of breadsticks, cookies or cupcakes. Whatever you are making, baking or creating in your kitchens, enable fun preparing your feast.